Galway East Tourism - Corralea Court Hotel in East Galway, West of Ireland.Galway East Tourism - Corralea Court Hotel in East Galway, West of Ireland. Modern contemporary 3* Hotel located in The Square in Tuam. The perfect meeting place for business or pleasure. Krugers Bar serving Breakfast, Carvery and Bar Food Daily. All Sporting events shown live. Corrals Restaurant catering for all occassions, confirmations, communions, christenings. Menus tailored for individual needs. Mitre and O'Connor Suites available for meetings and functions. 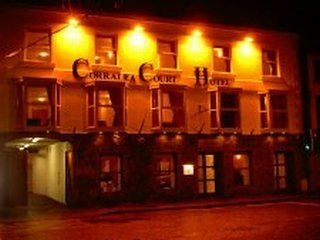 The Corralea Court Hotel is a stylish 3 star property located in the heart of Tuam, just a short drive form Galway city. Being recently renovated the Corralea Court Hotel offers tastefully designed en-suite guestrooms fully equipped with up-to-date amenities. Corrals Restaurant serves gorgeous cuisine prepared by award winning chefs with a wide wine list. The bar Krugers is one of the trendiest pubs in Tuam, offering a menu, carvery lunch, tea and coffee, seven days a week. The Corralea Court Hotel is also a great choice for business with 2 meeting rooms, the Mitre Suite and the O'Connor Suite which caters up to 100 delegates.